Soundbreaker is an amazing documentary that follows some of the sonic adventures. Unique music style of Finnish accordion player Kimmo Pohjonen connects rock music, folk music and other style. All sounds originat from Pohjonen´s accordion and his own powerful voice. Movie trailer. Soundbreaker. Soundbreaker takes part in competition programme at 49th international television festival Gold Prague which takes place from 13th to 17th 2012 in Zofínský Palác in Prague. Do you like accordion or are you an accordion player? Are you living in Czech Republic? Do you know about some accordion concert or about a place where we can listen to accordion music? Follow us on facebooku and let other accordion fans know. Help us to support accordion in Czech Republic. Charity concert for lonely cats 11.10.2012 5 p.m. I would like to invite you to a charity concert "PRO KOCIKY" which takes place on 11th October at 5 p.m. in Gallery of West Bohemia, 13 Prague street in Pilsen. The profit of the concert is addressed to the organisation Svoboda zvirat, o.s. that takes care of lonely cats. 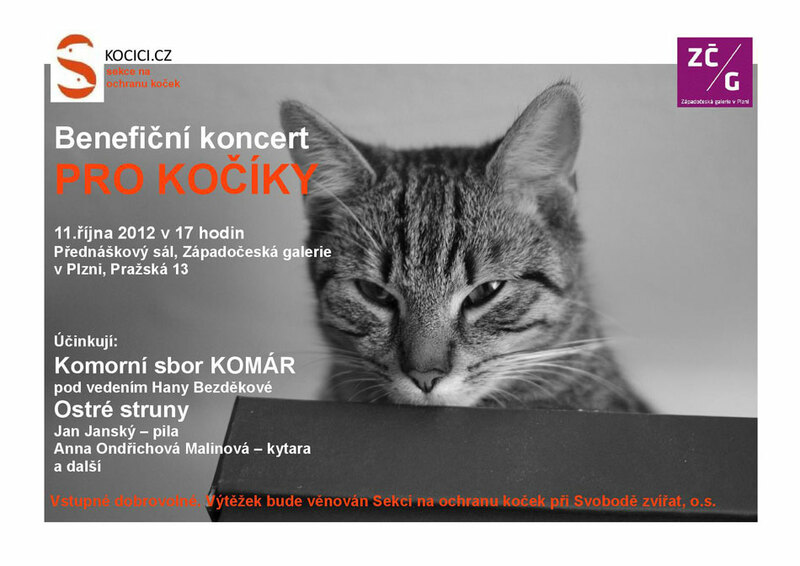 The Concert "PRO KOCIKY" is a part of 10th jubilee exhibition of lonely cats. The exhibition itself takes place on 20th October from 10 a.m. to 5 p.m. in cultural hall JAS. The goal of this exhibition is to find a new home for loneny cats. "Gathering under Eiffel Tower" in Frišově Villa 26.09.2012 7 p. m.
Please, let me invite all fans of French chansons and musettes to my concert "Gathering under Eiffel Tower". Concert in French style takes place on 26th September 2012 in Frisova Villa at 7 p.m. 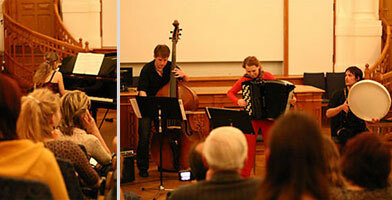 The programme of concert is composed of accordion solo, accordion duo and a trio of two accordions with a singer. 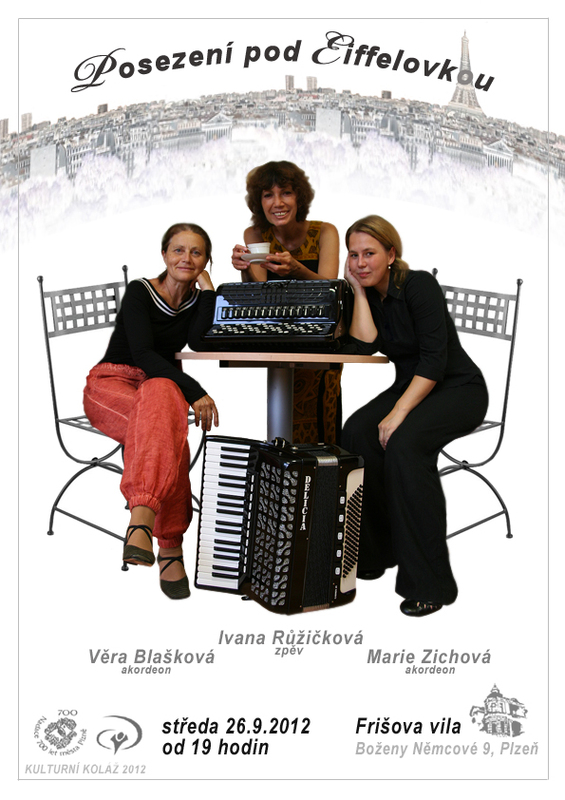 My guests are Vera Blazkova - accordion and Ivana Ruzickova - vocals. You are very welcome to come and join us with a cup of coffee, tea or glass of wine. I have become an accordion teacher at music school of Bedrich Smetana in Pilsen since September 2012. This offer, which was given to me, is a nice opportunity to continue in my teaching career. I am very happy that I am back in Czech Republic after 30 months of living in Ireland and 3 months in Spain. "I am back my beloved Pilsen!" This news is not directly connected to music, but I hope that all of this knowledge will be useful also in my cultural activities. I studied Marketing, Advertising, Public Relations, Buyer Behaviour and International Business Communication. I successfully passed FETAC exams from Marketing and International Business Communication and ICM exam from Marketing. A big news for all fans of Finnish accordion player Kimmo Pohjonen. The Prague festival Struny Podzimu 2011 holds his concert this year. The first performance of Kimo Pohjonen in Czech Republic will be an extraordinary event. Concert takes place in Veletržní palác in Prague on 2nd of November. Kimmo Pohjonen will present his project UNIKO with Proton String Quartet and Samuli Kosminen. The Uniko project is holding several awards and prizes and will be an exceptional audio-visual experience for all audience. Oficial web page of Kimmo Pohjonen can be found here. The evening concert of Hazel Collins (cello) took place in Theatre 1 in Irish World Academy of Music and Dance, University of Limerick on Sunday 3rd July. 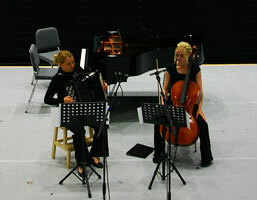 We were proud to present our duo Hazel Collins (cello) and Marie Zichová (accordion). Duo played pieces of Astor Piazzolla in our arrangement for cello and accordion. The concert started at 7:30pm and was recorded. So we hope to have our first sound recording soon. This concert was a premiere performance of our duo and we are are happy that it had a big applause and success. Currently we would like to take part at summer festivals in Ireland. I am starting a new project in collaboration with Hazel Collin. Hazel is an excellent cello player. Our accordion and cello duo would like to present mainly the music of Astor Piazzolla in our arrangement. From 08.03.2011 Show "Fiddler on the roof"
The Hall Theatre in Galway presents show "Fiddler on the roof" by Jerry Bock (based on a book by Joseph Stein). The show choreographer is Peter Kennedy and musical director is John Roe. I am happy that I am playing an accordion part in this beautiful musical. Show starts every night at 20 p.m. Tickets are avalible online on the Galway Hall Theatre webside or before the show in the theatre. 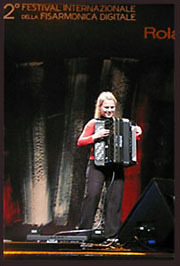 Christmas accordion concert takes place in concert hall, Maoin Cheoil na Gaillimhe in Galway, Ireland. I will present a clasical music, frech musette, jazz and argentinian tango. Promotion of my concert can be found here. zde. 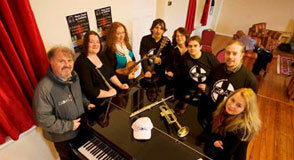 Charity concert organised by Goal Society takes place in Mayrick hotel in Galway, Ireland. Tickets are avalible in Opus II. music shop and in Mayrick hotel before the concert. The profit of the concert is addressed to help to Pakistan. I would like thank to Alessandro, who has brought me a new accordion accessories from Italy. Thank you. 21st August 2010 Opening day and concerts in Maoin Cheoil na Gaillimhe. Opening celebration of music school Maion Cheoil na Gaillimhe took place at Mary´s college on saturday 21st August. There were few concerts of diferent style and presentation of pedagiogic staff. I was honour to open the series of concert with my accordion performance. Pictures from the opening celebration of music school Maion Cheoil na Gaillimhe can be found here. From September I am teaching accordion at Maoin Cheoil na Gaillimhe. I am a teacher of accordion at music school in Galway, Ireland. This offer, which has been given me, is a nice opportunity to present an accordion, my teachinh experience and me in Ireland. Maoin Cheoil na Gaillimhe is situated in the heard of Galway and pedagogic staff has an extraordinary hight level. My profile can be found on the official web page of music school here. The Accordion Day took place in Co. Kells and the day was full of accordion events. There were two accordion competitions. The first one was focused on the classical accordion music and the other on the irish traditional music. I was pleased to be a jury in the classical accordion competition. I judged 31 candidates in six categories. The day ended with a concert of Accordion band K & S who played a programme for its Belgium tour. I performed at the Al lIreland Accordion Festival which is held by Irish Accordion Association every year. Festival took place at the Ramon Theatre in Virginia from 27th to 28th March 2010,Co. Cavan, Ireland. New design, new forum - you may leave me a message, remark or reminder. Extraordinary concert takes place in Museum of West Bohemia in Pilsen on 31th May 2010 at 6 p.m. This concert is dedicated to accordion orchestra PEGAS which existed between 1992-2000. The members of PEGAS are still playing accordion as a hobby or it has become their profession. Pegas desided to organise a Memorial concert which takes place 10 years after PEGAS disbanded. Come to listen the best songs from Pegas repertoire such as Conguest of Paradise, Happy Swing etc. I have moved to Ireland. I hope to find here some music inspiration such as Irish ballads and Irish folk music which I like very much. I participated in seminary of Frederic Deschamps which was hold by conservatory in Prague. Frederick Deschamps is one of the best accordion players and teachers in France. I had the honour to meet him and his students during my studies in France at several competitions. His seminars are very benefical to the accordion world and Frederic´s hunour is really very original. I was pleased to help with organisation of accordion competition for the youngest accordion players. The main organiser was Music School of Bedřich Smetana in Pilsen, where the competition took place. The Pilsner Accordion competition has a long tradition and is very popular between the youngest accordion players. There were about 40 participants and in general the competition was very successful. It would be nice to have more competitions for accordion players like this one in Czech Republic. I would like to say thanks to the Foundation Život Umělce which is supporting my studies at Italian Accordion Academy in Urbino, where I study the Alexander technique. The Alexander technique is a really unique method. Master classes under excellent accordion player and teacher Claudio Jacomucci are very interesting and fruitful for me. I would like to continue in my studies and hand my gained experience over. The Accordion Exchange of Experience was an excellent event with a very friendly atmosphere, More information can be found in section projects. Please, let me invite all accordion players to the 2nd Accordion Exchange of Experience which takes place in Kněžice in the Českomoravská vrchovina region from 21th to 23th November 2008. Besides the accordion master class, there will be a very interesting programme composed of lectures, discussions and audio-visual projects. I have a pleasure to be one of the lecturers in this class (together with other marvellous accordion players and pedagogues). For more information and registration please contact the main organizer Jindra Kelíšek, his email address can be found in the announcement. The International Roland V-Accordion Festival took place in Rome from 6th to 8th November. The festival promoted digital V-accordions and talented accordion players from all around the world. There were 17 candidates from countries such as Canada, Brazil, Finland, New Zeeland, United States, China, Spain etc. I was very happy that I could represent the Czech Republic there. I had only one month to learn how the V-Accordion works and to prepare myself for the Roland V-Accordion Festival. At the beginning, it was not easy for me, because the V-Accordion has a lot of programs and effects which cannot be found at acoustic accordion. But when I went through the manual, lots of things became clearer. I flew from Prague with manager of Roland company in Czech Republic Mr. Tomáš Kos. The competition took place in the very centre of Rome. The organisation was very successful and the atmosphere was friendly. The festival was devided into two parts. The first part took place on Friday in convention hall in Hotel Ritz which was very comfortable.The second part of the festival was a short performance of all candidates at the gala concert which took place in a very nice Auditoriu Parco della Musice on Saturday. The gala concert was moderated by Alessandra Bellini and its programme was very interesting and variegated with performance of duo Sergio Scappini (V-Accordion) and Joan Garrobe (guitare) or performance of dancing group with V-accordion player Mario d´Amario. The entire festival was very interesting and it was a new experience for me. At the point I would express my sincere thanks to Roland Czech company who took care of me during the V-Accordion festival in Roma. The list of participants, results and further information about the Roland V-Accordion Festival in Rome including photos can be found here. I obtained the 1st prize in the Senior category on the 2nd Roland V-Accordion Festival 2008 in Prague. I will represent the make Roland in Roma (from 6th to 8th November 2008), where I will play accordion Roland FR-7b in the International Finals of the Roland V-Accordion Festival 2008. National finals of the 2nd Roland V-Accordion Festival 2008. took place in Prague during the music fair Muzika 2008 in Holešovice. Roland organisers opened two categories - solo junior (for players upto 17 years of age) and solo senior (for players older than 17). There were lots of players who were interested in this competition and arrived there with various short programmes. It was comfortable for players and pleasure for auditors. Prizes were really nice and all competitors played excellent. The first prize in category junior was V-accordion Roland model RF-2 and the first prize in category senior accordion Roland model FR-7. 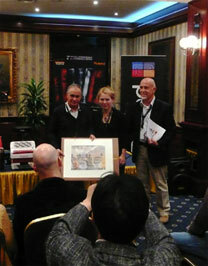 The winner of the senior category was nominated for the Roland V-accordion festival in Roma. I participated in the Roland V-accordion Festival in Prague in the senior category where I played two compositions: F. Angelis-Amalgame and V. Zubitsky-Omaggio ad Astor Piazzolla. I am very happy that the jury and auditors enjoyed my performance and I succeeded and won the first prize. I will attend an accordion master class in Urbino. The collaboration with the Italian Accordion Academy in Urbino and Claudio Jacomucci is new inspiration for me. It is an honour for me to participate in master classes under great musician and accordion player Cladio Jacomucci who studied Alexander Technique in ATCA institute in Amsterdam and obtained a teaching certificate there. Now, he is utilising this method in accordion perfomance. The master class was visited by a teacher and accordion player from Spain, Inaki Alberdi. He also gave lessons during the master class and in the end he performed on the concert together with Inigo Aizpiolea in Comunale Theatre in Cagli. Photos from the master class here. In October, I will participate in XXXIII International "Citta di Castelfidardo" Prize And Award for accordion bands and soloists in Italy. It is one of the most famous accordion competitions in the world. Detailed information about the competition is available at this website. I have qualified for the national finals of 2nd Roland V - Accordion Festival which takes place during the music trade fair MUZIKA 2008 in Prague–Holešovice. For more information about V - Accordion Festival. Within the music section, there are new samples recorded during my concert on 28th April 2008. I wrote a thesis on accordion and chamber music. The thesis is focused on interesting and popular groups in Czech Republic and in the world. The publication is in czech including 98 pages with color illustrations, photographs and attached music samples. For more information, please contact me. European Festival of Accordion Orchestras is a very popular festival. Recently, it has got a high prestige and a lot of international orchestras come to Praque to participate in it. Every year, there are orchestras from Czech republic, Moldova, Slovakia, Estonia, Spain, Norway, Croatia, Ireland etc. Festival programme consists of gala concerts, accordion party, night boat trip and a competition which is opened for three categories: Junior Accordion Orchestra, Classical Music, Light Music. President of the festival is famous composer Jindřich Feld and its chairman is Ladislav Horák. More information about the festival can be found at www.accordion.cz. This year, I had a pleasure to participate in this European festival. National Competition in Pardubice is a competition of students of conservatories from Czech Republic. This year, the competition is realised within four instrument fields: piano, accordion, guitar and singing. The competition takes place from 16th to 18th November 2007 at Conservatory in Pardubice and concert halls in Pardubice. Each conservatory can nominate up to 6 accordion players. The competition has only one round. The Jury consists of 5-7 accordion experts. This year, the chairperson of the Jury is professor T. Rácz from Bratislava. I am going to compete in Cat. 3. Last Monday, I went to the concert in Prague. That was an extraordinary concert of Richard Galliano which took place in Music bar in Lucerna. Richard Galliano is an accordion player who have changed the history of accordion. Galliano presented his program together with great jazz vibraphonist Gary Burton. The both players were accompanied by Philippe Aerts (double bass) and Clarence Penn (drums). The concert was performed during the Prague Jazz festival. This original connection of accordion and vibraphone is presented on a CD called L´ hymne a L´amour released in September 2007. On 12th March 2007 I passed the audition for colaboration with the Symphony Orchestra. My interpretation of Fairy Tales (written by Václav Trojan) impressed the Jury and they made me an offer to play this composition for solo accordion and Symphony Orchestra at the annual concert in June in Měšťanská Beseda in Pilsen. I would like to say thank you to my brilliant piano player Dana Řeřichová. She collaborated with me and helped me to prepate Fairy Tales. More information can be found in the section projects. I attended a class of music psychology, intellectual training and eurhythmics under Marian Ostman from Sweden at the end of October 2006. Marian Ostman teaches music psychology, intellectual training and eurhythmics at Conservatory in Sweden. Her class was very interesting, each players must work with his breath and his movements during the concerts and practices. That is very important for continuous stream of music. I had some exceptions concerning Marian´s class, but if you think that a psychic state is not important for music, try to visit this class or another similar. The seminary was arranged by the Conservatory in Pilsen. I stayed 10 days at Music Academy in Kragujevac in Serbia. My cooperation with Music Academy in Kragujevac is very pleasant for me. I always bring a lot of impressions and experience from Kragujevac. I consult my accordion program with Prof. Radomir Tomic and Vojin Vasovic. Prof. Radomir Tomic is the director of Music Academy in Kragujevac. He is very sensitive man and he always gets my admiration. I am very pleased that I can work with him. Vojin Vasovic is a reputable professor. His teaching is full of energy and impulsion. During this stay I was invited to the class of Viatcheslav Semionov who came to Kragujevac to celebrate his 60th birthday. He is a reputable teacher from Moscow, Russia. I took Viatcheslav's master class for three days and I attended lessons such as: Life and Work of Viatcheslav Semionov, Pedagogy – Method of Accordion Teaching, Technique, Authenticity of Compositions etc. I am happy that I had an opportunity to consult my accordion program with Viatcheslav Semionov. Viatcheslav Semionov is excellent pedagogue, composer and player. It was a pleasure for me to work with such a star of the accordion world. I also obtained the invitation for the Viatcheslav Semionov's class in Rimini (Italy), which took place the following month. 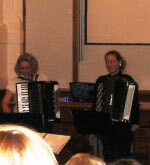 I attended a master class of accordion under Jytte von Ruden, professor of Royal Music Academy in Aarhus in Denmark. The master class took place four hours a day. I was invited to be an active attendant of this class. The seminary was arranged by the Conservatory in Pilsen.